There are lots of different reason why people goes to some restaurants and not to others i.e. either the food is very good or the atmosphere is pleasant and inviting. For now let’s focus on what makes a restaurant looks good and inviting and let’s forget for a moment the chefs and their delicious food. There are lots of possible factors to make a restaurant attractive for the customers liking. In this article we’re going to feature one of our client restaurants that used a combination of modern and classic interiors that’s very trendy nowadays. Most diners today always wanted to go to a restaurant that offers unique design whenever they eat out. That’s why there’s no surprise that restaurants have become channels for some of the most creative interiors around the world. Designers have combined technology, art, and even nature among other themes to produce a new restaurant design that will amaze the diners. From the ceiling, wall, unique furniture and more, restaurants have always used something creative to induce interest and pleasure using their design. As you can see in the images this classic restaurant has the right touches of modernity in it by using a unique ceiling design with an interesting complementary brick wall that will surely catch your eyes. A stylish outside the box ceiling design can totally change the look of a restaurant. Believe it or not, ceilings are extraordinary and often becoming the focal point of some of the most creative restaurants in the world and our client also want to incorporate that idea. Designing a ceiling that’s identical to a brick is really a bizarre idea and one of kind concepts that you don’t usually see anywhere. And by supporting it with real brick walls it just solidifies its unique concept making it more fascinating. Our client also used classic furniture with brown wood tables and chairs that somehow match with the brown shades of the walls and light beige ceiling, giving a countryside vibe with a mix of modernity in it. Using simple furniture that matches the color of the surrounding makes the walls and ceiling standout better and contribute to create a more relaxing atmosphere. 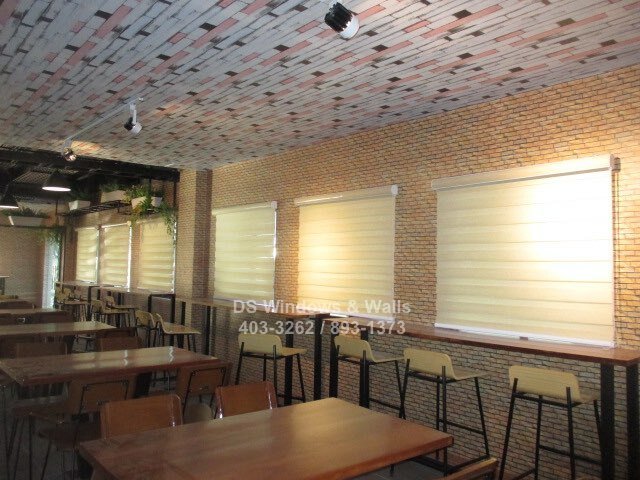 For the finishing touch finding the best window covering that can complement and improve the restaurant’s look can be Duo Shade blinds also known as Combi Blinds shades. 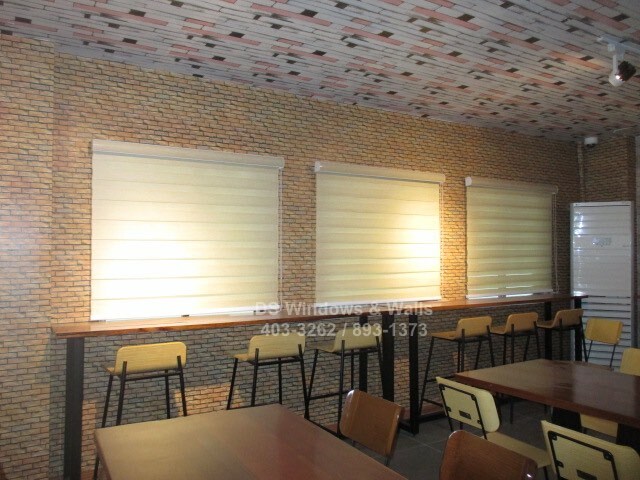 It’s the most in demand shades today for both commercial and residential area that’s available in different color and design that suitable with all types of theme and probably the best fit for restaurant window. It has a modern look and feature that will help boost the restaurant appearance. 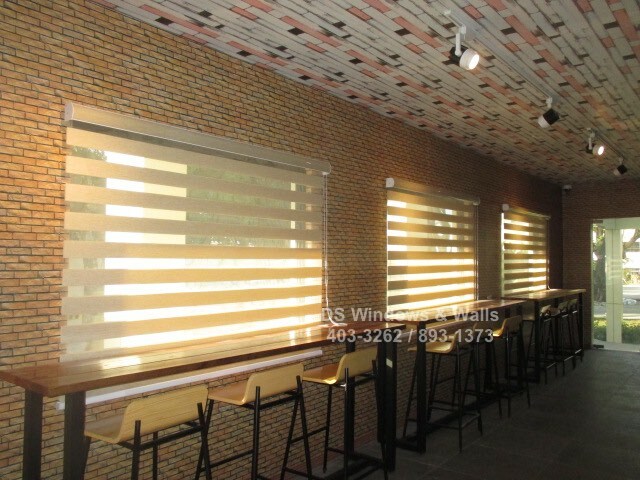 It’s also great since it has a translucent fabric for the diners to enjoy the outside view while they eat and converse with friends or family. And since it’s also a dual fabric, it’s perfect for light filtering so the diners can enjoy just enough sunlight without giving them any discomfort from too much sun. For Batangas, Laguna, Cavite area you may also call (Globe) 0917-583-0214 or (Sun) 0922-592-6111 or 0908-989-4676 – look for Patrick Villapando.